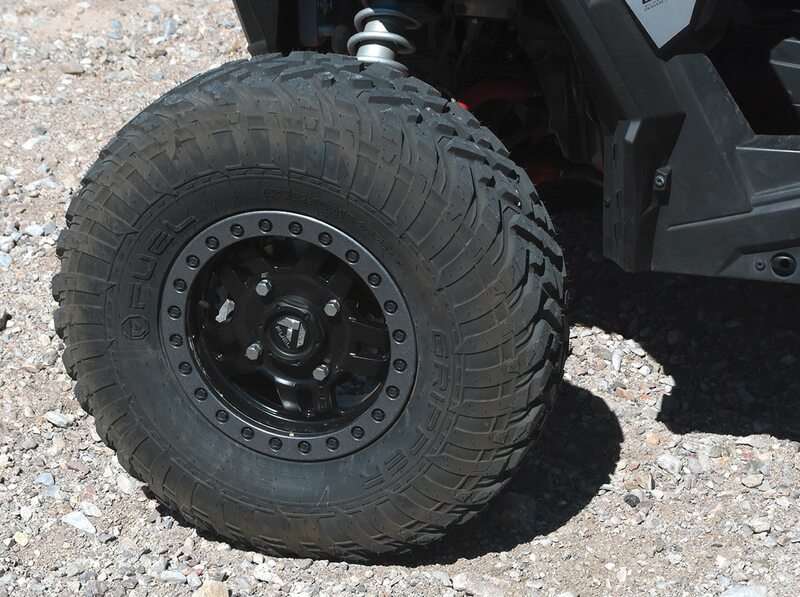 Fuel Off-Road is an aftermarket truck tire and wheel company that has also entered the UTV market with high-quality new designs. We tested the eight-ply Fuel Gripper 30x10R14 wheels in September 2017, and we were impressed with the hard-terrain grip and durability. Fuel has improved the Gripper since then and released a 10-ply Gripper R/T in 32x10R15, so we got a set mounted on Fuel’s Anza D557 15×7 beadlock wheels and installed them on our Dynamix Edition Turbo. Retail is $385 for each wheel and tire, but we found online prices as low as $130 per tire and $120 per wheel. The Gripper R/T has DOT approval for street use and has an N speed and 1050-pound load rating. It actually has a 31.6-inch diameter and a flat, truck-like tread pattern with siped lugs for extra traction. For a hard-pack tire, the lug pattern is pretty open. The Anza D557 beadlock 15×7 wheel has a matte black finish with a split five-spoke design, and the anthracite beadlock ring attaches with 24 high-quality bolts. The Anza D557 wheel accepted the OEM Polaris lug nuts, which saves the cost of purchasing custom nuts. The beadlock wheels secure the Gripper outer bead for low-pressure use, and the Gripper sidewalls proved themselves tough and fairly rigid for predictable handling. For a fairly open tread pattern, the Grippers are relatively quiet on pavement and hard dirt, and traction is excellent on most hard surfaces. They even hook up well on silt-covered hardpack, and the 32-inch Grippers roll over obstacles much more smoothly than the OEM 29-inch Bighorns. 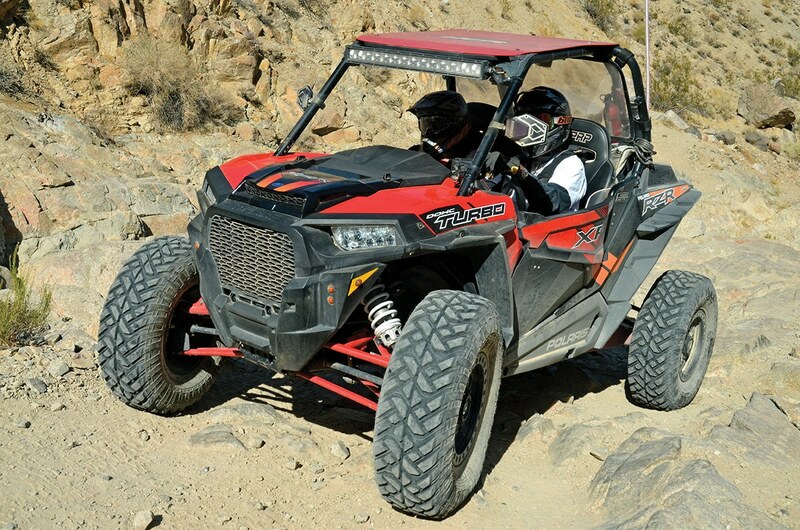 They offer excellent grip on rocks, but steering in deep sand and silt isn’t as precise as with other hard-pack tires we’ve tested. On harder surfaces, they slide predictably with good feel. The new 10-ply Gripper 32x10R15 radial is a tough tire that provides impressive traction and handling in all but the loosest conditions, and it delivers a smooth, quiet ride on hard surfaces. The Anza D557 beadlock wheel is a great-looking and tough rim with a nice finish, and it uses the stock Polaris lug nuts.